• With the second portion of the 2018 drilling campaign now completed, a complete review of litho-structural model is underway for the O’Brien project. “We’re excited by these high-grade gold intercepts, which occurred 180 metres below the projected bulk sample area. These results demonstrate the strong continuity of gold mineralization in the enrichment vector defined in the heart of the O’Brien deposit. In light of recent drill results, a structural reinterpretation is underway for the project as a whole. According to the geological team, structurally controlled faults, possibly conjugated, could control high-grade gold mineralization. Over the next weeks, we will obtain the results from this proposed model”, commented Mario Bouchard, President and CEO. Results are presented as down hole width; true widths are estimated between 55 to 70% of down-hole thickness. Radisson will be presenting at the upcoming Vancouver Resource Investment Conference 2019 held at the Vancouver convention center on January 20 and 21. Investors are invited to visit the company at booth #409. 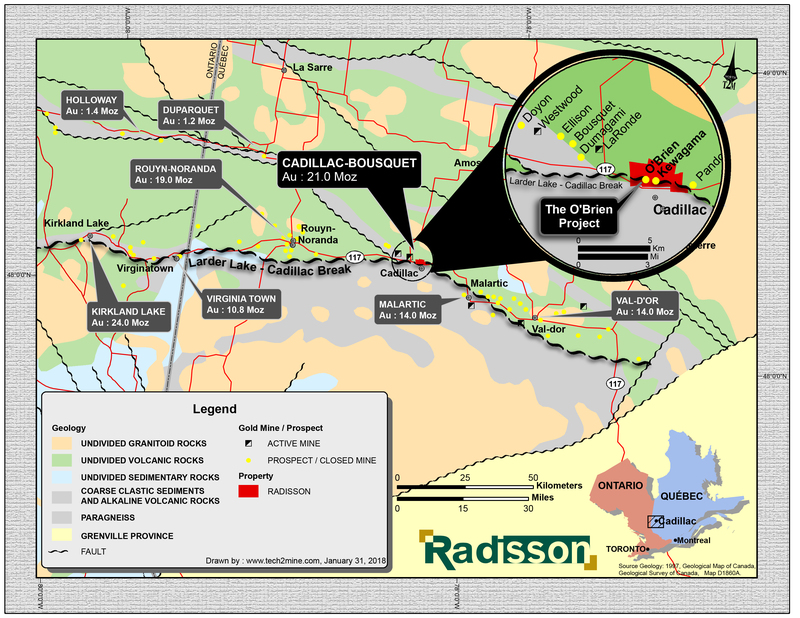 On January 21st, Radisson will be featured in an Abitibi focused panel moderated by Thom Calandra and a company presentation will be held at 2: 40pm PT. All drill cores in this campaign are NQ in size. Assays were completed on sawn half-cores, with the second half kept for future reference. The samples were analyzed using standard fire assay procedures with Atomic Absorption (AA) finish at ALS Laboratory Ltd, in Val-d’Or, Quebec. Samples yielding a grade higher than 5 g/t were analyzed a second time by fire assay with gravimetric finish at the same laboratory. Samples containing visible gold were analyzed with metallic sieve procedure. Standard reference materials and blank samples were inserted prior to shipment for quality assurance and quality control (QA/QC) program. Richard Nieminen, P. Geo, Exploration manager, acts as a Qualified Person as defined in National Instrument 43-101 and has reviewed and approved the technical information in this press release.